This machine has independent actuating unit and electrical system. Adopting the button centralized control, our 4 column hydraulic press can realize the adjustment, manual and the semiautomatic operating modes. The hydraulic press can realize constant pressure and fixed travel range, with time delay function to ensure the pressure. The working pressure, speed and distance of travel can be adjusted within the specified range. The 4-column hydraulic press has optimized structure design. Its hydraulic system utilizes cartridge valve blocks and offers reliable performance and long service life. With low impact force from its hydraulic system, the 4-column hydraulic press features few leakage points and connection pipeline. Meanwhile, the hydraulic press is designed with independent electrical circuit control system, which ensures convenient maintenance and reliable performance. Additionally, the 4-column hydraulic press utilizes central button control system and has two different operation modes for customers to choose from. 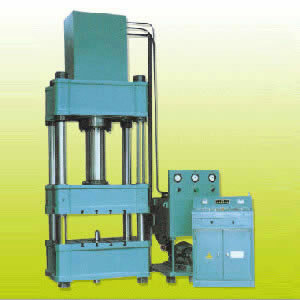 Rugao Yaou Company is a China-based manufacturer and supplier of 4 column hydraulic press. In addition to hydraulic press, we also produce oil drilling tools, well cement tools, hydraulic press brakes, and so on. As a result of their reliable quality, great durability and economical prices, our products are very popular in Germany, America, Kazakhstan, Turkey, India, and more. We welcome more global customers to try our products. Thank you! Our single action hydraulic press is designed with a computer optimized structure. It has the features of being simple, economical and practical, and is widely used in the petroleum, railway, and other industries.